Peer review or hatchet job? Deconstructing Cornwall’s Council’s planning system. | Cornwall – a developers' paradise? Peer review or hatchet job? Deconstructing Cornwall’s Council’s planning system. On January 7th a peer review on Cornwall Council’s planning department was published – Final Planning Peer Report – Cornwall Council Jan 7 2016. This was leaked to the press in early March at the latest but unaccountably still cannot be found on the Council’s website. As late as April 4th the Council’s leadership was treating it as private and confidential. So why were they so coy about it? On reading this peer review you’d be forgiven for thinking you’d fallen asleep and woken up in an alternative universe. This is a world where the six external reviewers conclude that Cornwall is ‘closed for business’. It’s a place which has had ‘low building rates in the past’, where developers go in fear, their advice ignored by a council where planning officers are regularly bullied by councillors who are overwhelmingly ‘anti-development’. the housing stock and population of Cornwall grew at three times the rate of that of England in the half century between 1961 and 2011, four times that of Wales and 28 times that of Scotland. 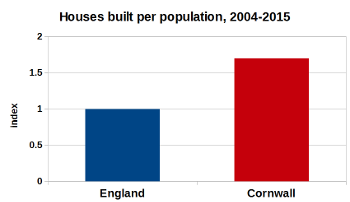 more houses are being built in relation to the resident population in Cornwall than anywhere else in the UK. the 52,5000 house target of the Local Plan is a 16% increase on recent historic building rates. Moreover, in plumping for its original 47,500 target the Council adopted a figure closer to developers’ proposals than those of local residents and parish and town councils. If all this is being ‘anti-development’ then it’s a bit worrying to ponder what ‘pro-development’ might mean. The conclusions of the peer reviewers, who humorously entitle one section ‘evidence-based decisions’ are entirely unrelated to the above evidence, which of course is completely ignored. What can only be described as a hatchet job on behalf of developers merely recycles hoary old myths. For example: ‘post building surveys have shown that the vast majority of market homes are lived in by people from the surrounding area. House builders pointed to the common perception that new homes are bought by people outside the area, rebutting this “myth” with evidence of recent strong sales from people keen to stay in their local towns and villages responding to pent up demand and low building rates in the past’. The ‘low building rates’ is an outright lie and the logic of the rest verges on the incredible. As natural change in the Cornish population is negative (meaning there are more deaths than births) the need for extra houses generated by the existing population is very small, estimated to be between 6,000 and 13,000, even allowing for the backlog of people in housing need. The remaining 35-40,000 houses are not ‘needed’ at all by the existing residents but are to cater for demand for housing from future in-migrants. Therefore, if these mysterious ‘post-building surveys’ (none of which could be produced by the planners when they were requested in 2012) find that all new houses are going to locals then 35-40,000 old houses (or around 2,000 a year) must be being bought by incomers. This seems extremely unlikely, especially given the marketing strategies of the volume housebuilders and some local estate agents, which unashamedly sell their new houses to the Lifestyle Cornwall market. Either all our old houses are being sold to in-migrants, or there are thousands of non-enumerated residents currently living wild or in caves, folk who emerge from their lairs loaded down with wads of cash, to eagerly snap up any new houses that appear. While taking care to puncture the ‘myth’ that new housing triggers in-migration, the authors of the report conclude that the planning service is ‘not maximising the contribution it could make to delivering on the area’s economic and housing needs’. And here we meet the real reason the Council is embarrassed about this report. These naive pro-growth reviewers have blundered into revealing Cornwall Council’s real agenda. ‘Corporate priorities’ are unquestionable – ‘sustainable development and economic growth’, translated as a vision ‘to deliver on the potential that development can bring to the economy of the area’. There’s another, more hidden, reason to ‘capitalise’ on house building. More houses bring a new homes bonus and more council tax, more business, and more business rates. From the narrow perspective of the reviewers this is the only way to ‘maintain services’ in a context of government cuts. The Council has to allow developers to generate more income for it and thus attain ‘financial stability’. Nowhere does the report spell out how many houses would actually be required to plug the gap in government funding. But it’ll be considerably more than the current 52,500 house target being imposed and more likely to be over 100,000 houses in a 20 year period. 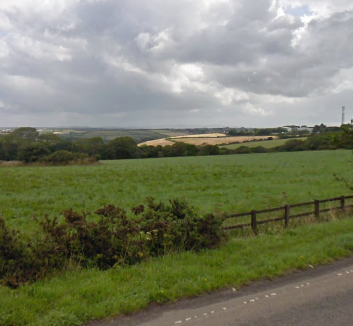 Some of the countryside west of Truro soon to be sacrificed for the sake of 2,500 houses and developers’ profits. The staggering environmental and cultural consequences of this beggar belief, but the reviewers have no words to say on that matter. Neither do they hint at the long-term unsustainability of continuing with this build regardless of costs scenario. No; they urge the Council to work closely with the Developers Forum and the unaccountable and undemocratic Local Enterprise Partnership to push through its agenda. The Council should ‘focus on the advantages of economic gain rather than infrastructure deficit’, a soothing thought the next time you’re stuck in a traffic jam or can’t get an appointment at Treliske. The problem therefore becomes local objectors. They’re preventing all the goodies that will flow from destroying our countryside, building thousands of houses and ramping up the population to ever higher levels. Oh, and they’re adding to the risks of private developers by increasing uncertainty, which means the poor old developers can’t offer so many inducements in the form of S106 agreements and similar (translate as make so much profit as they could do). ‘Committees cannot work on the basis that local residents’ opposition will “trump” sound evidence in the development plans’, while councillors ‘should not simply act on behalf of local residents’. To reduce the influence of objectors the review proposes a ‘rebalancing exercise’ which in their 1984 world turns out in practice to result in an even more unbalanced pro-developer bias to the planning system. The Strategic Planning Committee should be abolished and the three area planning committees reduced to two. The number of councillors on those remaining committees ought to be reduced to 11 and they should be ‘encouraged to raise their eyes from a local perspective’. Political leaders’ should ‘ensure that councillors with appropriate strategic thinking and decision-making skills are selected’. Meanwhile, local ward councillors’ right to question applicants should be abolished as it ‘heavily skews debate towards protecting and promoting local and vocal community interests’. It’s plain that, for these reviewers, local communities are the enemy. If packing the committees and rigging the rules isn’t enough then, ominously, ‘additional support and training for councillors in how to deliver hard messages should be provided’. From being tribunes of the people, councillors are to be re-educated into their new role as facilitators for developers. The reviewers confidently and arrogantly expect that ‘eventual acceptance of the need for significant housing growth will provide an important moment around which some political consensus can develop’. Unfortunately, they may be knocking at an open door. They claim that ‘the Leader (Pollard), portfolio holder (Hannaford), many councillors and senior managers’ are aware of the need for ‘change’. They point to the opportunities provided by a new Chief Executive (whose parroting of managerial soundbites such as ‘graphs of doom’ and ‘arcs of opportunity’ is already sending shivers of gloom down the spines of many at the Bunker). In addition, the Local Plan and the 2017 elections provide further opportunities to promote ‘strategic thinking’. On this last point, campaigners can agree wholeheartedly with them. The 2017 elections do provide an opportunity to ditch the stale, tired and unsustainable growth at all costs, developer-led, ostrich-like ‘vision’ being touted. On the contrary, it offers an opening for real political leadership, one that can cohere around a new, Cornish model of genuinely sustainable progress. Are we prepared to grasp this opportunity? This entry was posted in councillors, discourses and ideologies, environment, planning system and tagged LGA, peer review. Bookmark the permalink. 6 Responses to Peer review or hatchet job? Deconstructing Cornwall’s Council’s planning system. In view of the lies typed and facts ignored in the report, I think someone may have a legal case to answer to. When most people write on a subject they do based on emtions or their wallet. That’s the extent of our evolution at this time! Pingback: Primed for Success? Cornwall Council dreams of growth | Cornwall – a developers' paradise?